Check out the latest NorthStar health infographics to see information on today's important health topics presented in a fun, visual and meaningful manner. When you have questions about aging, be sure to turn to reliable sources, don’t just listen to myths about aging. Your health is too important to trust to just anyone. That’s why we’ve created this infographic – 5 MYTHS ABOUT AGING DEBUNKED – to address some of the questions about what really happens to your body after age 50. You know what the definition of insanity is, right? It’s doing the same thing over and over again, but expecting different results. And by that definition, all too often the mainstream approach to medicine strays across the line into insanity. There’s no better example of this than its treatment of prostate health and prostate cancer. Let’s face it, no matter how much of a stoic you are, when you hear the word cancer come out of your doctor’s mouth, it’s like someone dropped a bomb on you. Your head starts spinning and alarm bells begin blaring at full blast. But, the problem is, when it comes to prostate cancer, mainstream medicine has hijacked this natural fear response and turned it into a multi-billion-dollar industry. And countless men are paying a price that goes far beyond dollars and cents (hmm, or maybe that ought to be “dollars and sense”?). As I’ve explained before, you’re far more likely to die WITH prostate cancer than FROM it. Most prostate cancers are incredibly slow growing, and aren’t a threat to your life. Well, that is until you become the next victim of unnecessarily aggressive mainstream therapies. That’s why I’ve never been a fan of yearly PSA testing. Too many hasty and poor decisions follow in its wake. The twin epidemics of over-screening and over-diagnosis have ruined far too many lives. I shudder to think how many men have been left impotent or in diapers because of a slow-growing tumor that they may never have even known existed for the rest of their long and fulfilling lives. Statistically speaking, by the time we hit fifty, half of us will be experiencing some type of prostate health problems. If you’re finding it hard to sleep through the night without a potty run… or if you’ve taken to mapping out all the rest spots before a road trip these days… you might already be in that group. If you’re lucky enough to reach eighty… and as a Guide to Good Health reader I’m sure you will… then it’s practically a done deal that you’ll be sharing your life with an enlarged prostate. But I’ve got great news! You DON’T have to just grimace and bear it while you make yet another mad dash to the can. There IS another way, and it doesn’t involve risky surgeries or sickening rounds of radiation. If you’re not already experiencing prostate health problems, you may be able to head them off at the pass. And if your prostate has begun to make its presence known, you can tackle those annoying symptoms with some super support brought to you courtesy of nature. A mix of just the right herbs and supplements may even assure you of never again missing the ending of a movie, or having to deal with your buddies ribbing when you have to holdup the poker game for yet another bathroom break. Have you seen this chia infographic yet? If you have, then you know. But if you haven’t – you’re in for a thrill. Chia isn’t just the latest super food; it is the super food. And we offer it: BenVia Gold. Take a look at the chia infographic below and you’ll see: BenVia Gold is packed with the healthy fats doctors and nutritionists recommend for our diets – Omega 3s, Omega 6s and Omega 9s. These are the same fats found in fish and nuts that are heart healthy and good for us. They help keep our bad cholesterol levels low, and our good cholesterol levels high. And you don’t need huge amounts. A single scoop of BenVia Gold provides fiber, protein, and calcium. That single scoop even provides 51 mg of magnesium, which is good for muscle health, nerve health, heart health…too many benefits to begin to list! But just in case you’re interested, this article explains the many benefits of chia in great detail…take a look. Not at all. It’s believed the Aztecs used chia seeds centuries ago. And modern research into their health properties started over 20 years ago. That’s why we now have BenVia Gold. Because we want to make sure you have access to all the benefits promised by chia -- benefits you deserve. Stock up on these immune boosters to protect yourself from the flu before the flu season is in full swing, and they could help you make it all the way through the winter with barely a sniffle. Here’s another one for your “Why am I not surprised?” file. 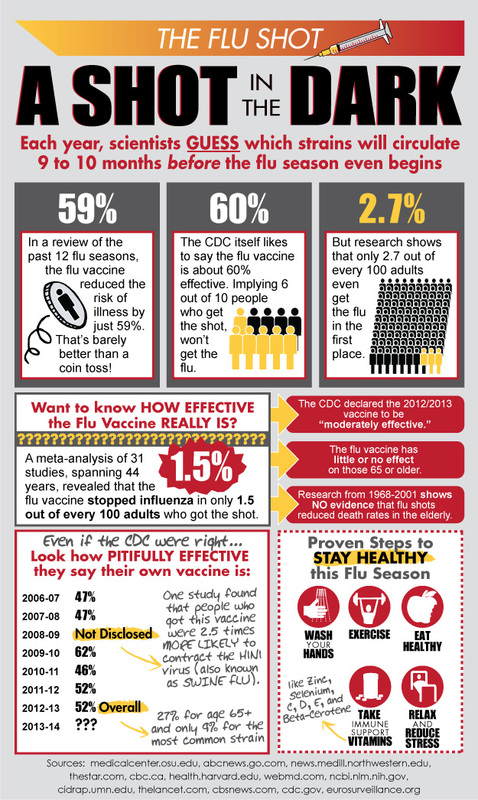 We’re back to the same yearly topic – ineffective flu shots. But wait until you see this…it’s a doozy this year! As usual, the government “health” stooges don’t appear to have any clue whether they’re coming or going. But one thing they DO know for sure is it’s flu season. You know what that means, right? Yes, it’s time for them to kick their ol’ propaganda presses into overtime and get their 46th Annual Flu Disaster Party started. And boy howdy they sure are outdoing themselves this year. You can hardly go a city block without stumbling across some dire warning about the coming killer Flu-pocolpyse. There’s just one problem, those hysterical warnings are built on little more than a house of cards. 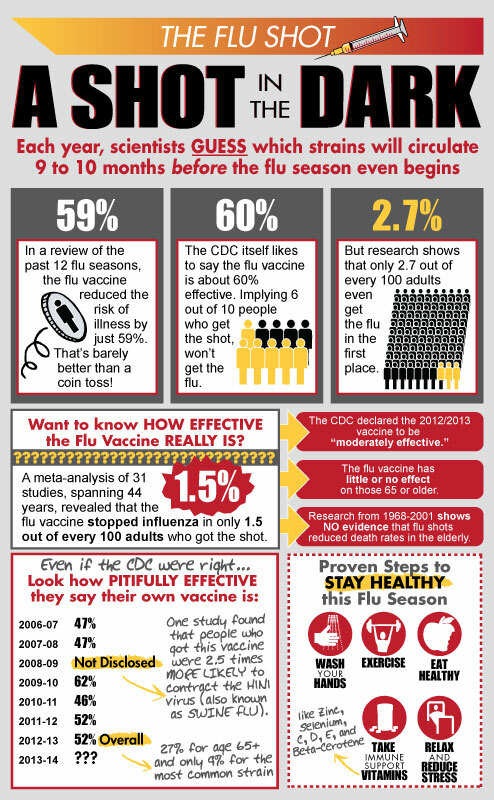 I think it’s high time for a dose of flu vaccine reality. Wouldn’t you agree? And luckily I’m just the guy to deliver it. When our research team here at NorthStar Nutritionals went digging, they ended up uncovering so many monkeyed-with flu statistics and flat-out lies it would make a Big Pharma executive blush. So our team did the only thing they could do, they decided to expose those lies surrounding the ineffective flu shot. They produced the one document I’m betting Big Pharma and their best buds at the CDC would be willing to pay just about anything to not have see the light of day. Which is just too bad Bozos, ‘cause we’re NOT for sale! The American public deserves to know the whole truth about the ineffective flu shots they’re having injected into their arms. And that’s why we’re providing this flu shot document to you, totally free of charge. To view an online version of this document on the NorthStar Blog, just click here. Please, feel free to forward this email and share this important information about ineffective flu shots with your family and friends. Together, we can expose this shot in the dark to the light of day!